I wanted to understand how expanded polystyrene (EPS) products are being currently used in building structures to make them more efficient. 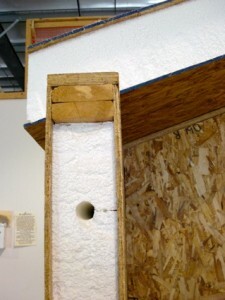 This post is part of How Styrofoam Can Be Recycled for Building. 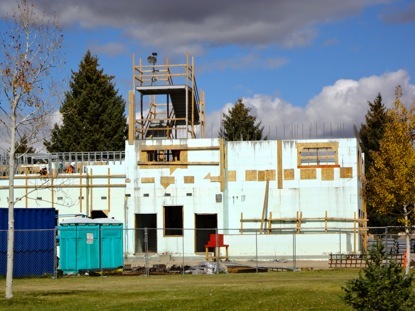 This building is in the process of being built with Insulated Concrete Forms. 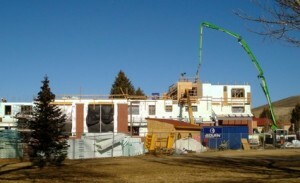 The second story is being constructed around the stairwell. This post looks at insulated concrete forms (ICFs), structured insulated panel systems (SIPS), and sheets of EPS insulation that are used between 2″ x 4″s in traditional building. Background: After moving out of the mountains to the city, I started getting depressed at the massive amounts of waste that I saw. Noticing Styrofoam and other waste decorating the fields after windy days, I started doing research to see if it would be possible to easily recycle Styrofoam by slightly modifying it to be reused in the building process. Because of its superior insulating properties, expanded polystyrene foam, often referred to as its trademarked name Styrofoam, is a popular ‘efficient’ building product. It is used as insulation in many different forms. Here are a few that are used in building. Stacks of ICF’s on a build site. Notice the knobs that allow for stacking. 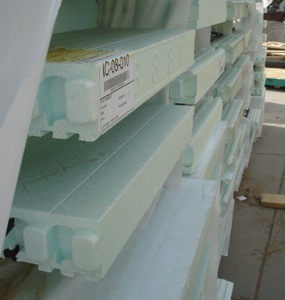 Styrofoam is used in efficient building within the use of Insulated Concrete Forms, or ICF’s. ICF’s are typically made out of a polystyrene or polyurethane foam. They have knobs like Lego blocks and are stacked upon each other to build the form and foundation of the walls. After they are stacked, concrete is poured into the expanded polystyrene forms. The long green arm of the concrete truck pours the concrete into the ICF’s. Here is a building being built with a truck pouring concrete into the middle of the foam wall. Nonetheless, it is still more efficient regarding energy consumption, than building without any insulation. A type of polystyrene or polyurethane is also widely used in structured insulated panel systems, often referred to as SIPS. SIPS suppliers and manufactures typically market themselves as green because the panels that make up the walls or roof of the buildings have superior insulating properties, thus it requires less fossil fuels to heat a structure. The use of ‘green building’ can be misleading at times, as the term ‘green’ can be used for earthen materials like adobe mud or strawbale, which are truly biodegradable earthen materials, as well as petro-based chemical types of building materials that have the ability to offer high R-values of insulation, allowing for greater efficiency within a better insulated structure, yet never biodegrade. Using SIPS can cut down on time within the building process because all the walls and roof of the house are built to the blueprint. Building with SIPS can be advantageous because the panels are prefabricated and made to the housing specs. SIPS ship in large sections and simply need to be joined together at the building site. In this way, the outer walls of a house, along with its insulation can be assembled in a matter of days. Here’s a passive solar house that was built with SIPS. Here’s another passive solar concrete house that used SIPS for the roof system only. There are straw SIPS also available as an green alternative for builders. Utilizing the insulating properties of naturally occurring harvest waste, similar to strawbale builders, Agriboard Industries manufactures straw-based SIPS. Here is a link to a passive solar strawbale house in Gunnison, Colorado and a strawbale house in Haiti. Sheets of insulation are cut to fill the space between 2x4s. They can be purchased in any building store. 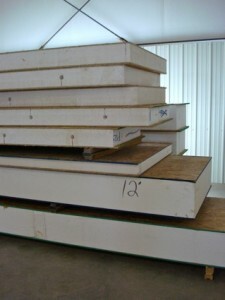 Sheets of either expanded and extruded polystyrene are often utilized between 2 x 4s in traditional builds. They can be blue or pink in color (XPS) or white (EPS). They have a thin layer of plastic on each side. The plastic is important because it is a vapor barrier. So, fine. It seemed like: 1.) Styrofoam has strong insulating properties. 2.) It seemed to be everywhere as a waste product, so it should be fairly easily obtained. 3.) Why not try to recycle it for building? Styrofoam can be recycled in the traditional sense, but these facilities only exist in a few states. Food grade Styrofoam can not be recycled. The #6 on the bottom of all those Styrofoam cups exists to mark it as polystyrene, a petro-product that can be recycled if it is clean, but often is not recycled. While the little arrows on the bottom might makes us feel better knowing that it potentially can be recycled, the reality is that it often ends up in a landfill. If you want to learn more about the recycling process, here’s other information that I found. What happens when Styrofoam is sent to a recycling plant. Recycling into goop, then it is sent to be manufactured into something like the base of shoes. More of recycling into goop. Company working with college to keep Styrofoam out of landfills. The information in the video is different than the information given to me by the City and County of Boulder. They said that they do not recycle food grade Styrofoam. This company, however, appears to be recycling it. Great to see. 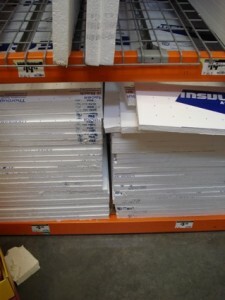 The next post is on the Styrofoam Recycling Project. Not sure Hagai. I think you’d have to check with recycling in your area. When I took the leftover bits to recycling, they only wanted clean pieces. That could be different in your area though. Is it a fire hazard and does it emit toxic gas / smoke when it burns? ?